Frugal Fashion Series: The difference between fake & original clothing | How to spot quality clothing items. Have you ever walked into a high-fashion (expensive) looking store expecting to find/splurge on top-quality clothing items only to walk away disappointed because the said store is full of not-so-top-quality items? Expensive doesn't always mean quality and once you understand that, your wardrobe becomes much better and your pocket becomes immensely grateful to you. This begs the question... What exactly does quality mean? I took a mini (teeny tiny) survey and 9 out of 10 people said that the first thing that came to their minds when quality was mention was in fact, "expensive". I'm not necessarily an expert in this field but I think I've learnt a lot of quality (ha ha) lessons from my various mistakes while shopping and building my wardrobe. 1. A new efficient way to look at quality. 3. Sure-fire ways to actually spot quality. Interested? Let's get right to it! Instead of looking at quality as "expensive", why don't you look at it as "Free of Flaws"? So you when you're holding a clothing item, you don't wonder how expensive it is. You look for flaws. It's that simple. Makes more sense right? Now for the frugal fashionista, We'll be looking at it a bit differently. As a frugalista, you don't just look for flaws when you pick that clothing item. You also look at the price tag. The question should be, "How can I get an item that's free of flaws for a reasonable/affordable price?" So that way, you don't compromise on quality and your pockets aren't empty. It's a more efficient way. Yes, finding a way to satisfy both parameters is quite difficult. I'll be covering that in this series too (so stay tuned!). There is only one difference between fake and original clothing. I kid you not. Curious? I couldn't bait you. The simple difference is in the workmanship. The manufacturer of the original clothing is trying to make a very good, long lasting clothing item, while the other is trying to make maximum profit from minimum resources. That's it in a nutshell. Now that we've started thinking of quality in more efficient terms, it's time for the practical part- how to actually spot these quality items. Since we know that quality means "Free of Flaws", when judging quality, we look for flaws. Easy innit? The not-so-easy part is knowing exactly where to check. There are two ways you could go about this. 1. You could look through the eyes of the manufacturer and ask yourself the question- "If I were trying to efficiently cut costs to make maximum profit, where I exactly would I do that?" Since I would go with number two (naturally), here's the list of what to look out for when looking for flaws. This is the easiest giveaway. If you're trying to cut costs, why make it so obvious? *shakes head sadly* Most cheap (in quality) clothes have rubbish (for lack of a better word) buttons. The buttons and embellishments look so fake, it's a giveaway. If the buttons look good however, check how well they're sewn on. Very well? Then that item has some quality. To pass the ultimate button quality test, a very flawless item would even go as far as giving you extra buttons. This simply means the manufacturer expects the clothing item to last long enough that you might have to change the buttons. How neat are the seams? When clothes are low-quality, the seams are almost always untidy or ripping apart. Dead giveaway. I wanted to go with thread count for the last one but what with the way flimsy materials are in fashion, it might not be as helpful so we'll go with fit. Have you ever tried on a clothing item and it just doesn't look right? You think its your body so you make another person try it and it still doesn't... fit? Low-quality clothes hardly ever have the right cut. The work done was shabby so it doesn't sit or fit right because of the poor workmanship. This should be easy enough to spot. I implore you- stay away from ill-fitting clothes. I made that mistake a lot. Ignore how pretty the dress is. Remember- the goal is to for the item to be reasonable in price, expensive in quality. While knowing how to combine the word quality and cheap (in price) is crucial as a frugalista, it is also important to define your style. Knowing what you like and don't like would make your frugal journey easier. How? You'll just have to wait for the next post. What quality mistakes have you made on your fashion journey? 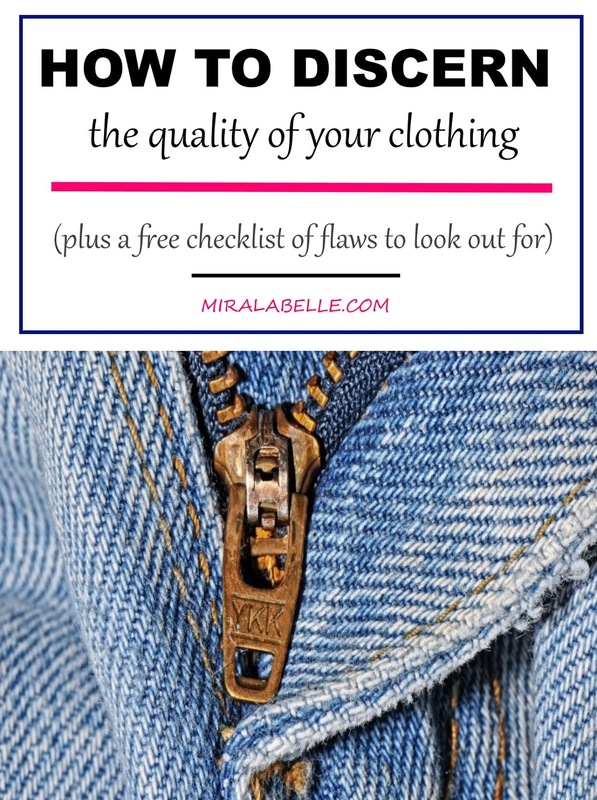 BONUS: There's a free checklist of flaws to help you discern the quality of your clothing items. Get yours here by signing up. You're welcome. Facebook, Google plus and Blogloving, let's connect! t-Wondering what to wear o hangout with your friends and family? Check out my outfit ideas! Nice! You have put so much work into this post and it is very helpful. Nicely done. Wow! What an inspiring article! Of course, expensive doesn't always mean quality. This is a very awesome piece. One way I check the quality esp trousers, I hold the part were there's a joining and try to pull it apart. If it's low quality most times you see the thread moving or even see holes. I'm so loving this frugal fashion. That is a very neat trick! Never thought of it. Thanks for sharing Tonye! Very well put together. Alot of people assume that expensive means quality. Thanksfor sharing. Yes! It's really not their fault. It's what we've been made to believe. Yes! Lots of people think expensive means quality. This post is so enlightening, mirabel. And I know the theme of discussion is clothes...but can I ask this; when my Aba brothers in Yaba are bending those flat shoes back and forth to show off its flexibility or its authenticity, does this method count for a way to discern if your flat shoes are quality or nay? Ps: you did a solid job on this post I must say again. Yes, it does count. They bend the shoes to show that the soles can withstand pressure, that they are sturdy and durable. 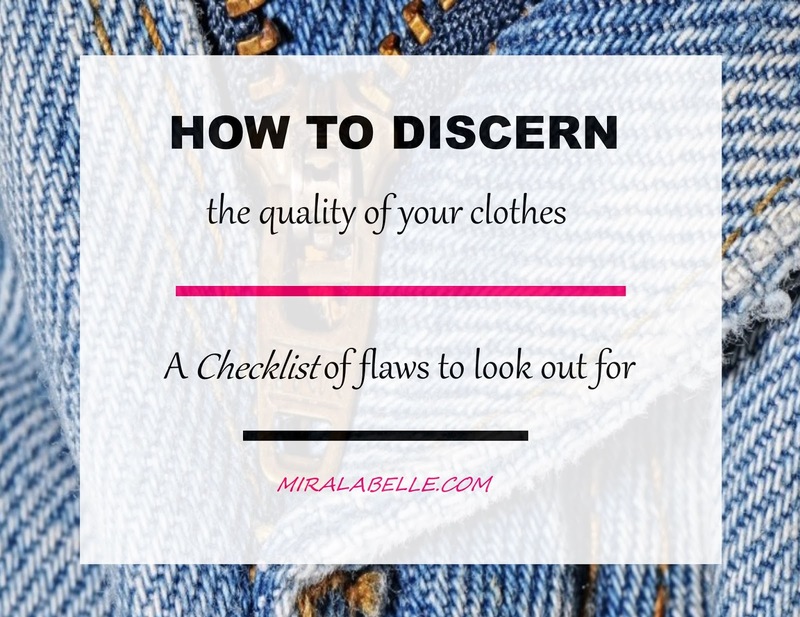 Check out the checklist- it entails potential flaws for bags, shoes and clothes. Hope this helps. P.S: Don't trust those Aba boys o. They have already mastered the art of bending even the ones that would soon spoil.